Portable Fume Extractors for Elevated Welding Operations - Sentry Air Systems, Inc. There are numerous welding-related occupations that require workers to frequently perform elevated operations, especially in maintenance and construction industries. Just as respiratory protection should be utilized during ground-level welding operations, it should also be used for elevated applications. If you typically use a stationary or portable welding fume extractor (i.e. local exhaust ventilation) for respiratory protection, you may be wondering how you’re going to get that 50-400 lb. unit up into the raptors or scaffolding. 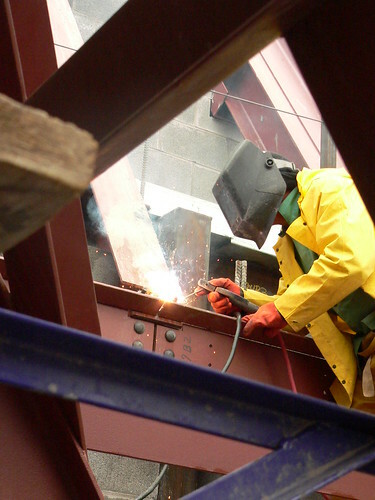 Depending on your application, the following options may provide adequate welding fume control for your work in elevated spaces (without the risks associated with 1) trying to move heavy fume extraction equipment into elevated spaces, and 2) going without respiratory protection). With a weight of only 12 lbs., the Model 200 Mini Welding Fume Extractor can easily be carried into elevated spaces [a carrying handle is included]. This recirculating unit internally houses a filtration system, which is typically comprised of a pre-filter and HEPA Filter [up to 99.97% efficient on particles 0.3 microns and larger]. This model provides up to 100 CFM of air volume [if you believe that you’ll need more air volume for your particular application, scroll down to see other model options that feature more powerful fans]. The models pictured above cannot usually be carried into elevated spaces, but can reach these spaces via flexible hose. Standard hose lengths are 12′ and 25′. The hoods of these hoses are magnetized, so they can be easily attached to metal surfaces for hands-free operation. For additional welding fume extraction options, take a look at our full line of welding models on our company website. You can also give us a call at 1.800.799.4609, email us at sales@sentryair.com, or fill out this form to receive additional information or a quote from one of our Applications Specialists.